McCarran International Airport (LAS) in Las Vegas offers customers and employees in need of immediate medical attention a welcome respite in Terminal 1. The Code 3 Urgent Care, located before the A/B security checkpoint, is the privately owned and operated facility with three patient rooms, an on-site X-ray machine and laboratory. In addition to treating ailments such as flu, strep throat, sprains and strains, it also offers employment physicals and drug testing. In operation since June 2017, fully 75% of the clinic’s business comes from airport and airline employees; 25% of patients are passengers. This winter, most visits were for basic respiratory and sinus infections, fevers, colds and the flu. “I look forward to being in Vegas through an entire seasonal shift, just to see how things change,” says Adam J. Daley, director of Airport Operations for Code 3 Emergency Partners. Last summer, the staff treated a lot dehydration cases—self-inflicted or otherwise, he notes. 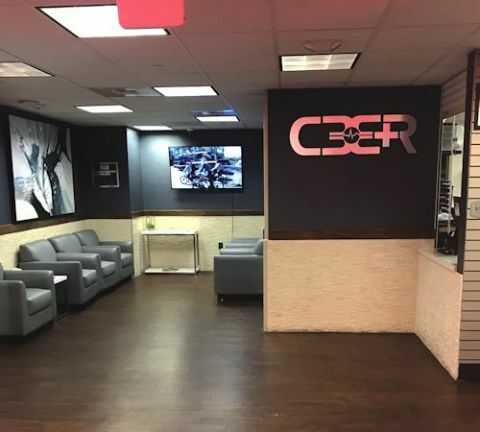 After less than six months, the clinic had a lot of repeat patients coming in for “concierge services” such as restorative IVs and B12 shots. Accidents tend to be the majority of one-off visits, says Daley. Rapid on-site lab testing allows Code 3 to screen for strep throat and flu, as well as provide urinalysis drug testing (pre-employment and post-accident). While this style of urgent care is new to LAS, the concept of on-site medical support is not. Code 3 is the latest in a series of partners providing health care services in the same pre-checkpoint location. Eventually, the health department wanted to cut its costs and obligations to focus more on street locations; and the airport had an opportunity to do something more with the concept. “We wanted to add an extra service that most airports don’t have,” explains Oram. A company called Airport MD occupied the space next, elevating the level of service with doctors of record on site. 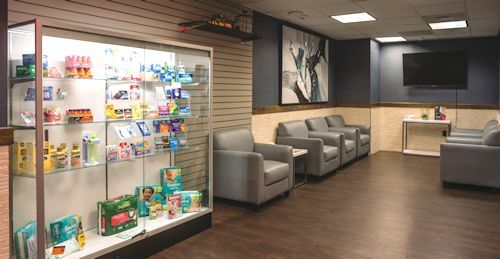 After Airport MD’s run, from March 2010 to September 2011, the space was converted into a full-service pharmacy and medical clinic. Daley reports that patient volume at the LAS clinic has been on a nice growth trajectory since opening last summer. Month over month, it is averaging a 15% gain in traffic. He credits the company’s chief executive, Carrie de Moor, M.D., FACEP, for being a visionary in understanding the complexities of the airport environment and launching the clinic at LAS and its sister location, which opened at Dallas/Fort Worth International in August 2017. “One of the things that really attracted me to the business model was that Dr. de Moor was really intelligent in trying to build these locations from the inside out. Long before we opened the clinics, we made certain that we got in-network with the insurance companies to cover the thousands of folks who work at the airport every day,” Daley explains. At LAS, specific services are pre-approved by Aetna and United Health Care, and the company has pre-registration arrangements for employees of the Clark County Department of Aviation, TSA, American Airlines, Delta Air Lines, United Airlines and Southwest Airlines. “Dr. de Moor wanted us to be at a point where it wouldn’t cost these employees any more to walk down the hall and see us at the airport versus taking a half hour to drive across town to go to another urgent care,” explains Daley. Beyond opening on-site medical clinics and pharmacies, some airports are jumping on another health trend: providing potentially life-saving education for passengers and employees. Cincinnati/Northern Kentucky International Airport (CVG) is one of 11 U.S. airports that have aligned with the American Heart Association with Anthem Foundation’s support to provide interactive kiosks that teach Hands-Only CPR in just five minutes. Wendi Orlando, the airport’s senior manager of customer experience, says that offering a quick and easy way for passengers to learn a life-saving skill is part of CVG’s mission to provide an unforgettably positive experience for the 7.8 million travelers who pass through its facilities every year. “It’s a good opportunity for travelers to practice,” Orlando says. The touch-screen kiosk begins with a video introduction and overview of the Hands-Only CPR method in English, Spanish or closed-captioning, followed by a practice session and a 30-second test. Airport personnel were intrigued by the educational outreach idea after learning about the large number of cardiac arrests that occur, and how pivotal immediate CPR is to victim survival. More than 350,000 cardiac arrests occur each year outside of hospitals, and 20% take place in public spots such as airports. According to the American Heart Association, Hands-Only CPR has been shown to be as effective as conventional CPR for cardiac arrests that occur in public, and CPR can double or triple a victim’s chance of survival. CVG located its educational kiosk post-security, before gates A6 and A7, to allow public usage 24/7. Since its August 2017 debut, nearly 2,800 users have logged in to take advantage of the free educational tool, reports Orlando. The airport’s emergency response team was excited about the program from the very beginning. 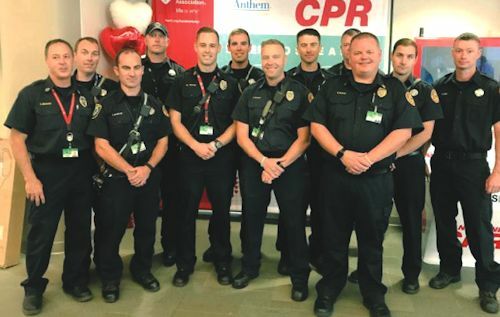 “Hands-Only CPR is a good skill to know, and it continues along with our commitment to life safety,” explains Fire Department/EMS Division Battalion Chief Dave Stoeckle. “We already have over 50 automated external defibrillators throughout the airport, and their significance has been proven. We have a 100 percent save rate, with over 15 cardiac arrests we’ve had on the airport; and the biggest reason for that perfect success rate of survival of a victim is because of fast bystander CPR and implementation of the AED. In addition to CVG, 10 other international airports in the United States offer Hands-Only CPR kiosks: Baltimore/Washington, Chicago O’Hare, Cleveland Hopkins, Dallas/Fort Worth, Dayton, Harrisburg, Hartsfield-Jackson Atlanta, Indianapolis, John Wayne and Orlando. To date, the airport kiosks have trained more than 57,000 people.